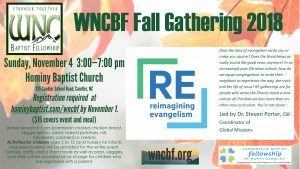 The Western North Carolina Baptist Fellowship is exactly that….a fellowship of Baptists in WNC. We believe "We are stronger together!" and our mission and vision are formed with this in mind. We are here to be a source of encouragement and support, and to do as Christ calls us as a fellowship of believers. Download the NEW UPDATED FORM here. Completed forms may be scanned and emailed to tjustus@mhu.edu. Please allow 2 weeks for a response. Please note that the wncbfnews@gmail.com account is no longer active for mission requests. At the heart of our ministry are ministries through local and global partners. We support these ministries through our prayers, volunteer work, and often, through our financial resources. Click here for a current list of ministries we support. Copyright © 2019 Western North Carolina Baptist Fellowship . Powered by WordPress. Theme: Spacious by ThemeGrill.